From Cat Piss studios in Portland, OR comes The Hot LZ's EP, "Bringdown - Comedown - Putdown" at classic 33 1/3 speed. Four tracks of laid back punk designed to bring you down by the glow in the dark light of this screen printed sleeve. After the electric has been turned off you'll be able to put this single on one last time - if you still had electricity....ok it will light the way to your gun cabinet - WHOA take it easy buddy. A-Side's "Margins of My Mind" has the sound quality and vocal delivery thanks to Mark Death of late '80s 7 Seconds or early laid back Black Flag TV Party stuff. There wasn't such an emphasis on speed and making things as rough and unintelligible as possible. Hot LZ still has something to say after all. The dueling guitar solos twist around hook back up in a flatlining smash. Could be that Suicidal Tendencies feel but with a sense of humor. Their weird arrival at their own trailer park version of punk metal. It's not hard or dark but fills that same spot, they 'aint exactly after tapping kegs either. 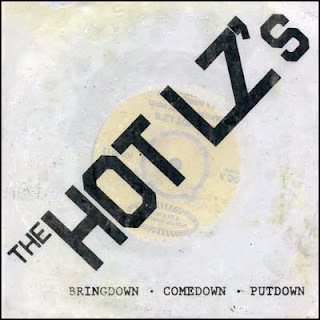 A classic '80s punk sound with a casual vibe like Nodzzz meets The Descendents. "I'm a Bring Down" has raw solid distortions mic'd in the center of the room punched through a tiny practice amp. Mark is whining with a little bit of echo, bringing you down and Taking those few chords and rocking them into eternity. He's delivering these verses like all of those conventions of putting melody together don't even matter, this is about getting that point across. May as well be a reissue from Last Laugh, that's what it's come to now, something recorded a few months ago just makes me think about the Last Laugh sounds that started it all. Like The Minutemen with bratty attitude but not completely over the top like Liquor Store, bad and raw. B-Side's "Wrong Side (of Right)" rakes in the jagged sea of riffs that slow down into a huge buzzsaw chipping away in a lunging heave ho against this cliff. The vocals are what's got me sticking around way back in the studio, a separate track to give you a sense of this guy so you can perfectly understand every word. This heavy dirge is going long enough for a solo even. For "Dumb it Down", a tom rhythm and bass line start this one off with an entirely new feel, the guitars still overwhelm everything with a weird scraping sandpaper sh-sh-sh sound and an organ turns this sinto weird new wave Feelies post punk. We're still in the era of those last laugh reissues though. It's more melodic than the rest of the single rolling along in that semi monotone cool delivery. A little looser than and melodic and the solo even has an extra kick. Everyone comes in yelling 'You've got to dumb it down!' really exactly what these guys are up to. Give it to you straight, no filler, don't get too smart. The lowest common denominator can be the real deal. Homemade junk punk. The best is this sleeve, taking a piece of regular letter paper and screen with heavy black raised ink and squeegee glow in the dark paint over it turning it into a thick wrinkled mess like the tracks inside. On dark purple vinyl with center hole punch out. What is that called - UK jukebox or something?